Welcome to this site dedicated to my writing – poems and prose. If you’re looking for anything to do with my various musical activities, please head over to my main site at mandolin.co.uk. The first anthology of poems and anecdotes, lavishly illustrated by Hilary James and with Augmented Reality is out! Please explore this website to read and hear some of the poems, see some double page spreads, and watch animated renderings of Hilary James’ digital artwork. Read journalist Molly Flatt’s interview with Simon Mayor & Hilary James in The Bookseller. 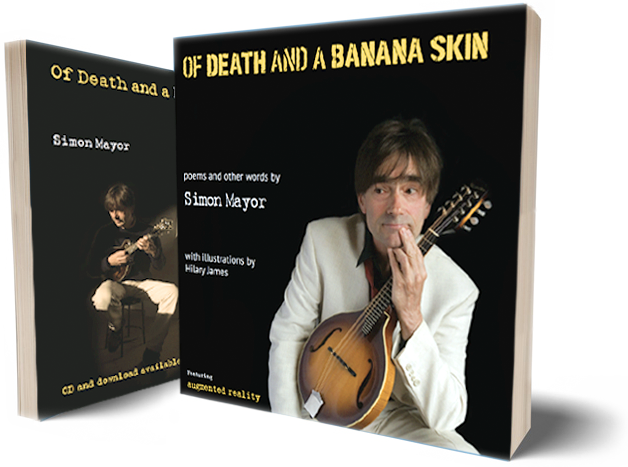 Hear Simon Mayor & Hilary James readings poems and playing live on BBC Radio 3 – “In Tune’ with Sean Rafferty. And if you’d like to Buy The Book, I would of course be delighted! Just click the image and you’ll be taken to the Acoustics Shop where you can order one. Simon Mayor, PO Box 350, Reading RG6 7DQ, England.